The Cemtech conference has earned a reputation for being the premier event for cement professionals worldwide, with annual events held in Europe, the Middle East and Africa, Asia, and the Americas. Every event offers authoritative presentations by senior industry figures, alongside an international exhibition with world-class suppliers showcasing state-of-the-art equipment, innovations and technical solutions. The conference will feature 25 presentations covering all aspects of the cement industry, from markets and trading through to manufacturing technology. 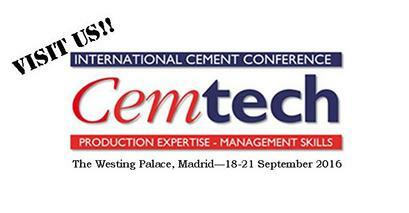 The Cemtech Conference will be held at the Westin Palace, Madrid, Spain on 18-21 September 2016. Cintasa will participate in the exhibition and we will be sharing our professional experience.